An English West-Country garden for exotic plant enthusiasts in a climate as close to Mediterranean as it gets on the UK mainland. 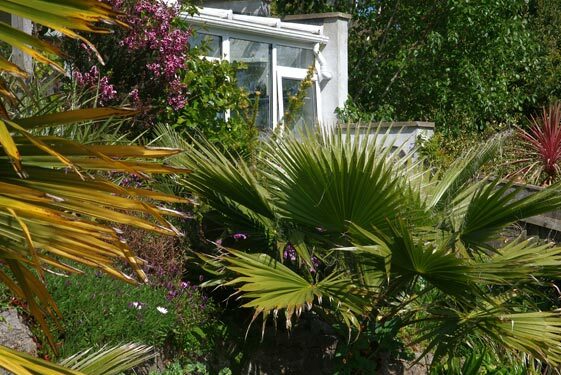 There are well-established palms, bromeliads, agaves, Aeonium, Aloe, bananas, tree ferns and other semi-tender plants flourishing in this sunny, south-facing and part-naturalistic Devon garden. There is also a spring-fed fountain, pond, rill and bog area with large tree ferns and abundant foliage plants. We regret that the garden will not be open under the National Gardens Scheme until further notice. However, we are happy to answer any enquiries either by e-mail or by telephone. Small groups of visitors are welcome by prior arrangement only. Contact here. Tillandsia bergeri growing on a Cordyline australis trunk against the south wall of the house. The plant does not receive any winter protection and has not suffered any winter damage over several years. It is growing in the company of a jasmine. The other Tillandsia species which has been hardy over many recent winters at Southern Comfort is T. aeranthos. Both species are native to South America. Like most gardens, the garden at Southern Comfort is in a state of constant change and evolution. This is in the nature of gardens. Consequently, the descriptions and the selection of photographs will be changed and added to sporadically. There is therefore no certainty that a particular plant, present today, will be present tomorrow; in addition, many photographs were taken during periods of the year when the garden is not open to the public. Even what is written below is now at least slightly out-of-date. The ¼ acre town plot with an art déco style house, Southern Comfort, sits on the south-facing slope of the Meadfoot Valley ½ mile from the centre of Torquay. The small, almost straight valley climbs in a westerly direction from Meadfoot Beach. It is sheltered from all but the fiercest easterlies which, mercifully, are relatively rare. The valley enjoys an exceptional microclimate. Within living memory at least, frosts have been very rare in the immediate vicinity of the coast in Torbay and, on the occasions when they did occur, were limited to car windscreens and the extreme tips of grasses. The climate is scaled down ‘Mediterranean’ in the sense that the bulk of the annual rainfall is limited to the colder 6 months of the year. Summer temperatures are regrettably not quite up to Mediterranean levels although winters are usually mild enough. Records show that annual sunshine levels are among the highest in the UK and that rainfall during the colder 6 months is twice that of the warmer period. Total annual rainfall is around 33” (840 mm) and the climatic zone is probably 9b. 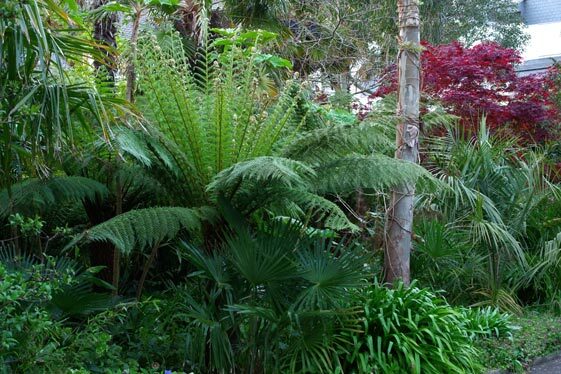 'The rainforest' is an area of damp woodland dominated by Dicksonia antarctica, smaller ferns, Trachycarpus fortunei, Rheum palmatum, hostas and hellebores. The dampness is ensured by a permanent supply of spring water flowing through a fountain into the pond, overflowing into the rill and finally spilling out onto the planting area. Although the fronds of Dicksonia antractica can, in ideal conditions, grow to over 4 metres in length here at Southern Comfort they are currently (2017) 2.7 metres long. Since 1997, when the original tiny ferns were planted, the tallest of the trunks has grown to a height of little short of 1 .7 metres - a rate of growth of 87 mm (just under 3½") per annum. I am not complaining. The same area seen from 'the inside'. Large-leaved plants contribute to the lush, tropical and exotic atmosphere of the scene. Many of the plants here are neither tender nor particularly unusual. However, without a few strategically placed true exotics such as Dicksonia, Trachycarpus, Chamaedorea, Cordyline and Tetrapanax the scheme would not be as successful. However, with a few exceptions there was what appeared at the time to be a disconcerting downward trend in both summer and winter temperatures. This was particularly noticeable since the winter of 2007-2008 which, taken in isolation, was not itself remarkably cold. It was merely the starting point of a run of exceptionally cold winters lasting up to the winter of 2010-2011. Four successive of bad winters, however, do not constitute a meaningful trend. Since then winters have been back on a more even keel. The plot consists of a sloping 40 metre front garden and a steep terraced rear garden of about 20 metres all situated about 300 metres west from the nearest beach. The height above mean sea level ranges from about 35 metres by the roadside to almost 50 metres at the top. The aspect ensures efficient use of natural light and heat. Windbreaks and south-facing walls give additional protection to tender plants both at the front and at the rear of the house. The nature of the soil was not fully understood immediately and inevitably mistakes were made and losses were suffered. While the immediate impression is that of dryness there is much water not far below the surface. In the rear garden above the house there are two springs of which one feeds and pressurises the fountain in the pond and then overflows into the rill and, finally, soaks into the bog garden. The second, which is more of an underground stream, is used to provide a normally plumbed supply of water in the greenhouse. In other areas, water seems to run down the slope over a layer of impermeable shaley clay situated below the bone-dry surface. Sometimes it finds its way below the clay deposit into a layer of loose rocks lying over impermeable limestone and marble and creates underground streams in places several metres below ground level. The result of this is that this area is favourable to those plants which are capable of sending deep roots in search of moisture. Although much soil has been imported by previous owners, especially into the front garden, the pH level is close to neutral but with a slight tendency to alkalinity. This tendency has been somewhat mitigated by a liberal use of garden compost with the result that camellias and the like do not require special feeding and do not suffer from chlorosis. Azaleas and rhododendrons are not likely to succeed here and I have only minimally experimented with them. Washingtonia filifera.The Cotton Palm's hardiness increases with age. Most small specimens planted outside do not survive the first winter or two even here in Torquay. We are lucky to have several growing at Southern Comfort. 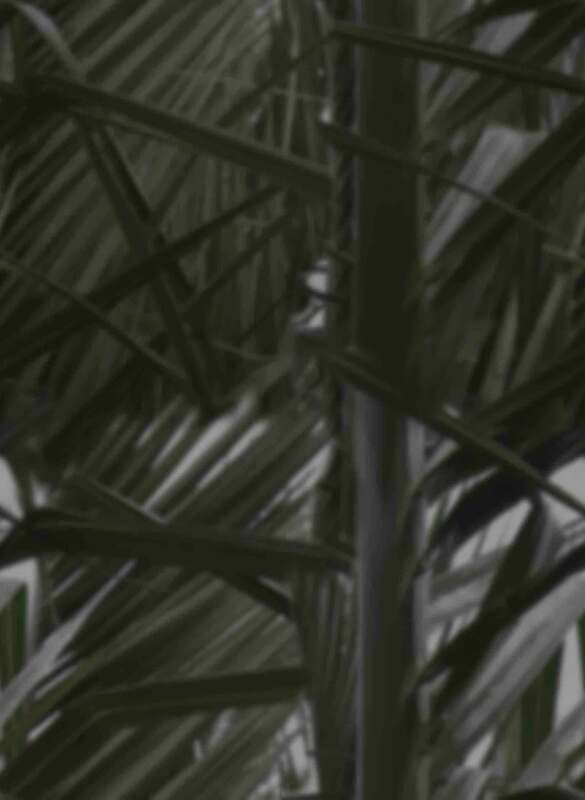 This palm is characterised by its fresh green colour, a profusion of threads at the end of its leaves and by vicious teeth on the petioles. It is native to the south-western states of the USA and Mexico. In its present form the garden was begun in 1997. At the time it consisted of what now seems to me a very peculiar combination of plants. Much of the front garden consisted of lawn, several lawns in fact – even in areas as little as 2½ metres wide. Initially, the rest was dominated by mop head hydrangeas, fuchsias, Coronilla, roses, assorted ‘lollypopped’ shrubs, cordylines, apple trees, gooseberry bushes, some standard holly trees and a couple of mature Trachycarpus. All the Trachycarpus were retained together with the cordylines, a Lawson's Cypress (Chamaecyparis lawsoniana 'Ellwoodii'), an ailing magnolia and a few odds and ends. A few years later the magnolia finally succumbed and the Lawson's Cypress began to droop so badly that it was put out of its misery. The pond and the rill which were beginning to dry up were rebuilt. A natural fountain was incorporated and a bog area (‘the rainforest’) was established by the side of the rill. The back garden at the time featured apple and pear trees, loganberries, blackberries, raspberries, a jungle of ivy and a tall bramble-laden leylandii hedge above a 3 metre weak retaining wall which soon collapsed burying a lean-to greenhouse. Part of the neighbour's garden then descended to cover the rubble heap and soon all became hidden by brambles. Most of the back garden has now been re-built and re-planted with emphasis on the Mediterranean style. In general, planting was strongly geared towards foliage, the creation of an ‘exotic’ atmosphere and what isd popularly called 'low maintenance'. Not all plants used are fully exotic - ‘hardy exotics’ is probably a better description of some of them - many just have an exotic appearance: Fatsia, Fatshedera, Paulownia, the larger mahonias, hostas, bamboos. Others have now become so commonplace that the adjective ‘exotic’ seems over-dramatic: cordylines, Phormium, Eucalyptus, various Magnolia species. Nevertheless, all these plants contribute splendidly to an exotic atmosphere in the garden and, correctly used even without further help, are able to mesmerise observers and transport them to distant realms. At Southern Comfort all these plants are used as solid base for more extreme exotic planting; they are, at the very least, an insurance policy against that severe winter which will turn the rest of the garden into a wonderland of exotic compost. Even here care must be taken since cordylines will survive a cold winter but will not survive a very cold one. Some years ago many of them suffered here in Torquay. At the opposite end of the spectrum are what I would consider to be the true exotics. They are the bananas, the agaves, the tree ferns, the aloes, the Aeonium, Strelitzia, cannas, tender aroids, palms, bromeliads and so on. Meanwhile there is one glaring exception in the form of Trachycarpus fortunei (the Chusan or Chinese Windmill Palm) and its dwarf alter ego, Trachycarpus wagnerianus. This palm is generally considered to be the most hardy palm in the world and is probably more resistant to cold than most of the other plants in the garden – reputedly it is hardy down to -15ºC or even more. The list in the above paragraph can now be extended to include a real palm which is ‘as hardy as nails’. 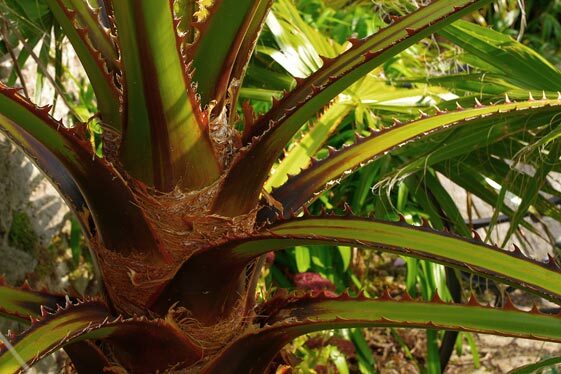 At Southern Comfort there is a large number of Trachycarpus fortunei (which seed themselves silly and become serious weeds if not dealt with at the seedling stage). Large-leaved rhododendrons would enhance the exotic atmosphere but soil pH would make growing them troublesome. An experiment with the impressive-leaved Rhododendron falconeri was unsuccessful despite it having been given a suitable 'pocket' in the soil. While an exotic atmosphere with an emphasis on foliage was the main aim of the garden there was an important condition. Both my wife and I agreed that the garden should be as 'low maintenance' as possible. We already had some experience gardening in West Sussex where our foliage-dominated garden itself worked hard at weed-suppression and the plants themselves were not over-demanding. This was something we wished to develop further. All plants I refer to here are grown in the open. During winter, no special protection is given to plants other than the shelter afforded by the site itself and careful choice of planting medium. Most winter losses I can attribute to rotting caused by damp and wet rather than by low temperatures. Initially, injudicious planting over areas of constant water flow led to losses of succulents, trees, shrubs and palms. Today, losses still occur but are less frequent. Another winter hazard is wind. The buffeting of leaves and stems over prolonged periods leads to lesions, cuts and breakages - some almost invisible to the naked eye - which are rapidly invaded by mould and fungus spores. Sometimes this causes otherwise unexplained losses towards the end of winter and even during early spring. Some species are so sensitive to winter damp that no matter where and how they are planted they still disintegrate during the cold months. In this way I kept losing Agave parryi, Agave potatorum and Aloe vera. Where the the plants are sheltered from above and kept dry from below they invariably not only survive but thrive; even Aloe vera manages the milder winters when planted up against a south-facing wall in well-drained soil. There is another group of plants which are neither exotic nor have in themselves any striking exotic appearance but which, if used correctly, appear miraculously to blend seamlessly into the company of exotic plants and proudly take on their features. At Southern Comfort such plants are Cotinus coggygria, Gleditsia triacanthus ‘Sunburst’, Catalpa bignonioides 'Aurea', various Viburnum species, a Japanese maple, Ceanothus impressus, Camellia, Hemerocallis, Rheum palmatum, Rodgersia, Ajuga, many ivies, the foliage in particular of Cyclamen, also the foliage of hellebores and a number of grasses such as Miscanthus and Arundo donax. I could go on. Zantedeschia aethiopica against a background of Eucalyptus pauciflora niphophila. Also visible are Trachycarpus fortunei, Trachycarpus wagnerianus and Arundo donax. The background for plants is an important element in the composition of a garden and generally, but not invariably, light against dark and vice versa works well. Similarly with different colours. In planning a garden it is very difficult to ensure that such visual rules apply to each plant and from every conceivable angle. Nevertheless, this should be at least part of the aims of an ambitious gardener. Finally, I grow a substantial number of plants which no amount of conceptual jiggery-pokery would bring into the fold of the exotics but which nevertheless happily harmonise with them. These are often plants which bring the mind back in line with geography and insist that ‘This is England, don’t forget’. They are best listed: snowdrops, daffodils and Narcissus, primroses, Geranium, garden irises, poppies, Pulmonaria, Weigelia, Philadelphus, Berberis ‘Dart’s Red Lady’ and an assortment of clematis. We leave the wild strawberries totally unmolested despite their aggressive qualities – in return, they reward us with delicious and aromatic fruit. 1. The south-facing front of the house – full sunlight all day, heat, dry soil. This area has a clump of Aloe arborescens still recovering (in 2017) after some major damage during the winters of 2007-2010. There is also a mature clump of Strelitzia reginae which had flowered regularly for some years although, like the aloe, refused to do so for two or three years following the recent vicious winters. Other plants include the wavy-leaved colourful Agave salmiana angustifolia 'Variegata' (which, incidentally, I was not alone at one time in confusing with a form of Agave americana), a Wisteria sinensis which climbs up the south face of the house and Aeonium arboreum. 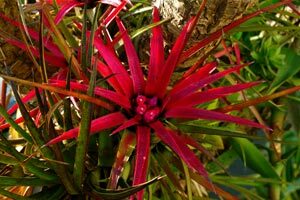 Of particular note here are the bromeliads growing as epiphytes on the two Cordyline australis. The Fascicularia bicolor bicolor (and F. b. caniculata), Billbergia nutans, Tillandsia bergeri and T. aeranthus have all been growing and flowering unaffected by the few minus 4 to 5°C brief lows during the bad winters. Aechmea recurvifolia 'Benrathii' is a recent addition to these epiphytic bromeliads. Of particular note here (in 2017 and fingers crossed) are two species of Aloe: A. ciliaris and A. thraskii. The former is (as far as I know) the fastest growing Aloe of them all; it is a scrambling plant and it reached three metres in height against the wall in as many years before slowing down. It flowers profusely during late winter and early spring. A. thraskii - we have one specimen which overwintered three times - grows naturally on the coast of Natal, South Africa, where it faces the warm waters of the Indian Ocean. What it thinks of Torquay is anybody's guess. 2. The woodland area east of the drive – dryish soil in most but not all places, dappled shade with some sun later in the day. Plants of note in this area are Eucalyptus pauciflora niphophila, Paulownia tomentosa - in this case grown for its flowers rather than its foliage, Grevillea robusta, several Trachycarpus fortunei (Chusan Palms) and T. wagnerianus, a couple of small Chamaerops humilis - a slow-growing palm native to the Mediterranean area, a Yucca elephantipes, a Cordyline australis which plays host to two species of Tillandsia (T. bergeri & T. aeranthos), Fascicularia bicolor, a variegated form of Billbergia nutans and a Cymbidium growing in a specially designed basket attached to the Cordyline trunk. During the winter 2010-2011 a Cymbidium (orchid) hybrid growing at the base of the Cordyline survived a few sporadic lows of minus 4 to 5°C to flower in the spring and has continued to do so ever since. I must finally mention here the evergreen Acacia pycnantha, the floral emblem of Australia and a weed in many places where it was introduced. This is an attractive small tree on the limits of its hardiness zone here in south-west England and, in any case I have much worse weeds in the garden. Amongst the shrubs contributing to the exotic flavour of the garden are: Hydrangea aspera, Pseudopanax 'Cyril Watson', Tetrapanax papyrifer 'Rex', a variegated form of Fatsia japonica, Fuschia arborescens, Embothrium coccineum (Chilean Fire Bush), Mahonia confusa, Aralia elata, the yellow-flowered Jasminum humile and the green variety of the black bamboo Phyllostachys nigra 'Henonis' - if indeed this can be called shrub. A supporting part is played by Magnolia stellata, Camellia x williamsii 'Debbie, Hydrangea serrata 'Bluebird', and some other fairly common items. Aloe arborescens has been growing in the south-facing border by the house for over twelve years (2012). Over the past few years only it has suffered some winter damage but always re-grew from the base. 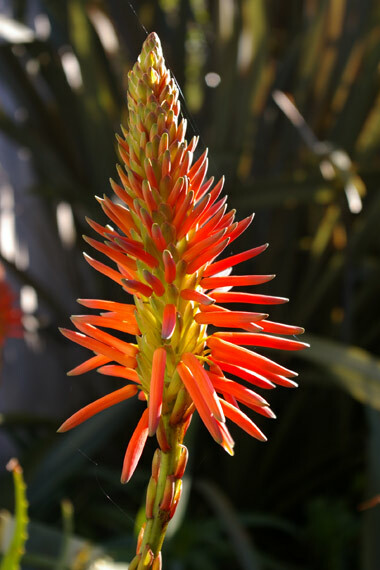 The flowers of aloes resemble those of the genus Kniphofia, to which they are related. is best grown sheltered from the wind, given plenty of rotting organic matter (or 'Growmore') and watered well throughout the growing season. M. basjoo soon forms a clump which can then be carefully divided taking care to have both roots and a viable growing point on each section to be replanted. Astelia chathamica is slightly less tender than Musa basjoo; it has silvery leaves and is happy in dappled or semi-shade where it stands out wonderfully against a darker background. While its foliage impresses its flowers disappoint, even enrage. I normally remove them as soon as they appear. Initially I was keen to have a selection of hostas growing amongst the trees and shrubs. Disappointingly most of the hostas gradually, some less gradually, declined. The reasons were various but demonstrate some of the problems associated with growing them. Initially they were all planted in adequately sized holes with plenty of compost and appropriately prepared soil. Nevertheless after a year or two root competition from other plants such as Cordyline and Eucalyptus sapped their vigour despite strong feeding and watering. In another area there was slightly less competition below ground and they grew more or less well at first. Soon the growth of surrounding plants was such that they provided a multitude of hiding places for snails all well above ground level. This meant that the snails were able to access the hosta leaves directly without descending to the ground with the obvious result that any sort of toxic slug bait was ineffective. It was only either by picking the snails off by hand or by spraying metaldehyde solution over all the foliage in the area could any degree of control be achieved. This was obviously not a valid solution especially for a reluctant gardener such as I. Eventually most of the hostas either went into terminal decline or were transplanted elsewhere. Remaining plants of note here are Hedychium coccineum 'Tara', Aspidistra elatior, Agave celsii, Aloe striatula, the giant Aeonium undulatum, Miscanthus sinensis variegatus (somewhat reversion-prone), Fascicularia bicolor (in the soil), Rodgersia aesculifolia, a white Crinum x powellii (not as free-flowering as the pink form but a real gem), Dryopteris wallichiana (a beautiful fern, impossible not to notice; over time it begins to show a small 'trunk'), a slightly tender Phlebodium (a relative of our common polypody; this one is growing in the soil but might succeed as an epiphyte). The question of what to plant under the clump of three Eucalyptus pauciflora niphophila has been a troubling one. Underplanting eucalypts is notoriously tricky. About the year 2000 when the trees were small there were hostas and hardy bananas growing under them with apparent ease but as the trees increased in size their roots began to dominate all but the first few inches of soil. At this point both the hostas and the banana plants were unable to grow to any size. In about 2010 the area was underplanted with Aloe striatula, Chamaerops humilis, Dianella tasmanica, Euphorbia characias, Arundo donax (variegated) and an Agave celsii. The Arundo donax may seem a strange choice; however, it has been growing in the same position - bang up against one of the trees - for about 15 years and in this time it has grown very well and has even spread moderately. Time has shown that this underplanting has been moderately successful. In this area - as well as in some others - much ground cover is provided by Helleborus orientalis which self seeds at will and is removed where not required. It is well-suited to this role possessing robust attractively shaped leaves which totally obscure the soil and flowering profusely from early winter to early spring. Just before flowering I remove all of the previous season's leaves in order to appreciate fully the coming blooms. At this time the old leaves are way past their best and will soon be replaced by fresh ones. This is a chore. However, it is not the only one with these hellebores for I also dead head most of them - especially those whose colours pleased me least a few weeks earlier. In this way I engage in a process of 'unnatural selection' - an inversion of Darwin which hopefully improves the plant population. Other ground cover is provided by periwinkle - variegated varieties of Vinca major and Vinca minor as well as by the curiously-leaved Iris confusa (or is it I. japonica? - they are both very similar). Of they periwinkles V. major tends not to revert but is not so good at ground cover as it lesser cousin; this one - at least the yellow margined one we grow here seems to have reversion as it main aim. I have given up trying to yank out the green shoots with the result that I now have some rampant green V. minor in this part of the garden. The iris, when observed en masse, gives the impression of being a palm, or a clump of palms. The leaves themselves are typical enough except that they do not grow up from ground level but form a distinct stem or shoot which can be a few feet long and roots near its tip. The flowers are a light blue and lack the substance of other more typical irises but are not without their charm. It flowers from late winter to mid-spring and it is then that I chop off all the shoots which by then begin to look messy. Ground cover provided by these three plants complements exotic planting very well. All the plants mentioned here work well together in creating an exotic atmosphere and I would not hesitate in using them again for the same purpose in similar circumstances. Needless to say their positioning must be right if a pleasing composition is to be achieved. A haphazard approach or a dependence on chance will be unlikely to produce much of value. Experiments with Washingtonia filifera and Syagrus romanzoffiana in this area were unsuccessful; the washingtonias all eventually succumbed to low temperatures and damp; the Syagrus (although winter hardy) stubbornly refused to grow one bit during any of the summers. However, washingtonias growing on the west side of the house and those in the sloping rear garden suffered little during the 2007-2011 winters and have grown vigorously since. A Cordyline indivisa, known for its volatility, grew well for four seasons, sulked for a bit and then gave up. Viburnum burkwoodii probably succumbed to honey fungus. A clump of magnificent hardy red-flowered Hippeastrum (from Hill House Nurseries) were moved into pots because slugs were incessently devouring the bulbs from the inside. x Fatshedera lizei 'Annemeike' after many years of steady growth had to be rescued a bad bout of reversion. Self-seeding Echium pininana proved unsuitable for the area and was encouraged to go and seed itself elsewhere. Schefflera taiwaniana had been complaining for a few seasons and was transplanted to the damp woodland garden where it has been much happier. Other plants which we miss but will not be replacing in the foreseeable future are: Magnolia wilsonii, Hydrangea macrophylla 'Blue Wave' and the gigantic Dahlia imperialis. 3. The damp woodland garden - ‘the rainforest’. This is the area west of the drive along the boundary with the road and up to the steps to the pond. Although the rill empties directly onto the soil there is probably not enough water present for this to be a true ‘bog garden’ let alone a ‘rainforest’ together with monsoon rains. The area is certainly quite damp the whole year round, has full shade, is very sheltered and has a moisture retentive clayey soil. 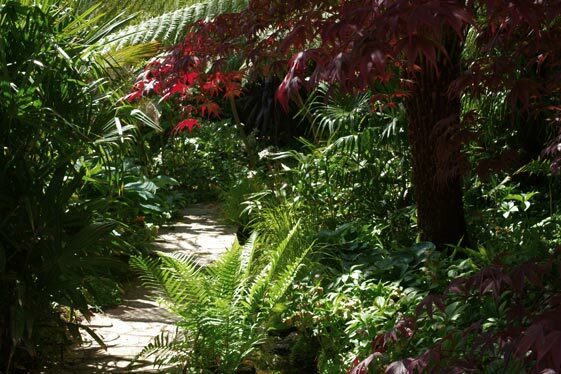 This section has the most naturalistic planting of the whole garden and could almost be mistaken for an exotic forest. Beschorneria septentrionalis grows on a drier part of the sunny damp terraces behind the house. The main problem is with slugs which can rapidly render the foliage quite shabby. There is something reptilian about the developing flower stalk - here appearing to be devouring a small olive tree. There is another species, B. yuccoides, which has slightly more attractive silvery leaves but a somewhat less impressive flower. Both these plants are best positioned on a terrace or steep slope where the arching habit of the flower spikes can be best appreciated. Plants of note in this area are: Aspidistra elatior, Begonia palmata, Begonia evansiana, Bergenia ciliata (a very large-leaved deciduous bergenia), Blechum chilense, the hardy bamboo palm Chamaedorea microspadix, Chamaedorea radicalis, Darmera peltata, Dicksonia antarctica, Hosta 'Hadspen Blue', Impatiens tinctoria, Impatiens omeiana, Magnolia grandiflora, Matteuccia struthiopteris (Ostrich Feather Fern), Mitraria coccinea, Rheum palmatum (Ornamental Rhubarb), Rodgersia podophylla, Rodgersia pinnata, Schefflera taiwaniana, Tetrapanax papyrifer, Trachycarpus fortunei (Chusan Palm) with epiphytic bromeliads (Billbergia nutans), Eucalyptus nitens, Woodwardia radicans (the Walking Fern). Low level ground cover is provided mainly by Lysimachia nummularia ‘Aurea’, the dreaded Helxine soleirolii (Mind-Your-own-Business), Saxifraga stolonifera, Hedera helix 'Goldchild' and self-seeding hellebores (orientalis, argutifolius - we became fed up with H. foetidus). 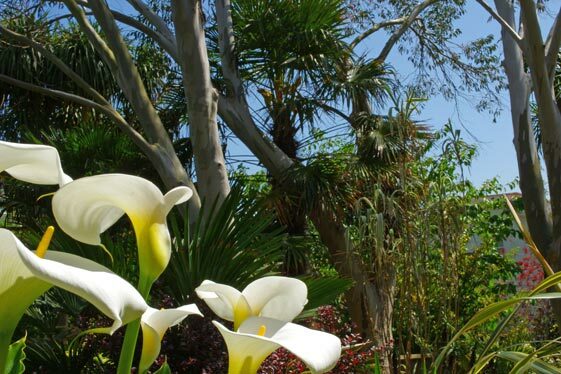 Shade and protection are provided mainly by several Trachycarpus fortunei, Dicksonia antarctica, Gleditsia Triacanthus "Sunburst", a Magnolia grandiflora, a Magnolia officinalis 'biloba' and a Japanese maple. A small Mahonia gracilipes was moved here from the dry woodland garden when it showed signs of stress. The increase in humidity had an immediate effect on its vigour. During winter and spring, when the this area opens out more to the light a small selection of early-flowering plants enhance its appearance: snowdrops, wood anemones, trilliums, Solomon's seal, crocuses, Erythronium, and marsh marigolds. None of these plants is even vaguely exotic, but they make a valuable contribution in what would otherwise be a fairly drab area at that time of year. In this area experiments with Cyathea medullaris a tree fern, Impatiens niamniamensis, Strelitzia reginae and Chamaedorea elegans the Parlour Palm were not successful; the plants were severely mauled by winter temperatures. However, the small feather palm Chamaedorea radicalis has proved to be quite exceptional; it requires to be grown in shade, has leaves of a beautiful dark green colour, flowers while still relatively young, germinates dependably and, very importantly, has so far been totally resistent to the lowest temperatures to which it was exposed (minus 5°C). It is ideal for higher level ground cover (photograph). The area between the drive and the rill was originally designed as a ‘meadow’ where spring and autumn bulbs were placed in an area of coarse grass all under a Eucalyptus gunnii. While there are still thousands of snowdrops, Narcissus, Cyclamen repandum (spring-flowering), C. hederifolium (autumn-flowering), some C. coum (winter-flowering), Colchicum automnale, Fritillaria mealagris and Primula vulgaris, these plants have recently been given the company of such 'unmeadowlike' plants as a blue-leaved Butia capitata (Jelly Palm), a Crinodendron hookerianum, Amaryllis belladonna, a recent clump of the restio Rhodocoma capensis (currently well into decline), Dicksonia Antarctica (tree tern), ginger lilies (H. densiflorum 'Assam Orange' & H. greenii). Much of the ground cover is provided by Pulmonaria saccharata which has the virtue of flowering in late winter. Later additions include a couple of Trachycarpus wagnerianus, a couple of dunalias (Iochroma) the massive and vigorous Canna altensteinii and a selection of hostas. The Echium in this area were exceptionally tall in 2008 with the tallest measuring over 6 metres. Gradually, this area has become less and less like a meadow and is now very much part of the damp woodland garden. The small waterfall by the pond takes the spring water to the rill. The damp area around the waterfall is being gradually colonised by mosses and liverworts. The concrete-lined rill eventually overflows the 'rainforest' bed where Dicksonia, Marsh Marigold and Darmera peltata grow. The relatively high pH of the water seems to be somewhat tempered by the organic matter in the soil and plants otherwise sensitive to high alkalinity seem to manage without any outside help. 4. The pond and rill (‘the stream’). The pond is fed by a spring on the high terraces behind the house. The rate of flow varies greatly according to levels of rainfall but it has never been known to dry up completely. Because of the high lime content of the rocks above the spring the pH of the water is high – around pH 8.5-9.0. Although as the water enters the pond its pH drops slightly it is still higher than the recommended level for fish and the like. Fortunately, we have never observed any ill-effects on any of the creatures living in the pond. The water enters the pond by means of a small fountain (with a pressure relief valve) and overflows via a small waterfall into the rill. All excess water flows onto a damp bed next to the pond. The rill runs parallel to a path dividing the damp woodland area from the meadow and finally empties onto the damp woodland area. One of the effects of the high pH levels in the pond is the inhibiting of vigorous plant growth. In fact, some plants even refuse to grow in it. For example, the growth of Canadian Pondweed had been extremely sluggish during the first year or two after re-plumbing the water flow to the fountain and re-lining the pond; duckweed disappeared after each of several introductions (although there may be other reasons for this) and a correctly planted Nymphaea odorata ‘Alba’ was looking very sorry for itself even after two years. Stratoides aloides, the water soldier, lost its will to fight. Algal growth in the pond is kept to a minimum by the use of bales of barley straw; this method has proved to be extremely effective and the water is generally crystal clear. Nevertheless blanket weed does have a very slight tendency to form in the pond and readily chokes the rill especially at times of low rates of water flow. The pond is a lined with a butyl sheet welded to the shape of the pre-existing round concrete pool which leaked badly. The waterfall and rill are constructed out of rocks, concrete and mortar. It is lined with waterproof epoxy paint. Any slight leaks at this point are unimportant since the water is constantly being replenished and in any case eventually flows into the damp garden. Notable plants by the rill include : Cautleya spicata 'Robusta', Carex elata ‘Bowles Golden’, Darmera peltata. The pond area includes the papyrus-like miniature Cyperus alternifolius, Iris pseudacorus ‘Variegata’, Zantedeschia aethiopica, Asplenium scolopendrium (Hart's Tongue) - this common native fern with undivided fronds is an excellent member of the exotic-looking crowd and is strongly encouraged all over the garden - and finally Aponogeton distachyos (the fragrant Water Hawthorn – in fact, nothing like a real hawthorn). Plants around the pond include: Iris sibirica, Canna 'Pretoria', Hedychium densiflorum 'Stephen', Stipa gigantea, a small clump of the royal fern Osmunda regalis (which does not seem to mind the high pH of the water overflowing from the pond), a declining variety of hostas, and Alchemilla mollis. 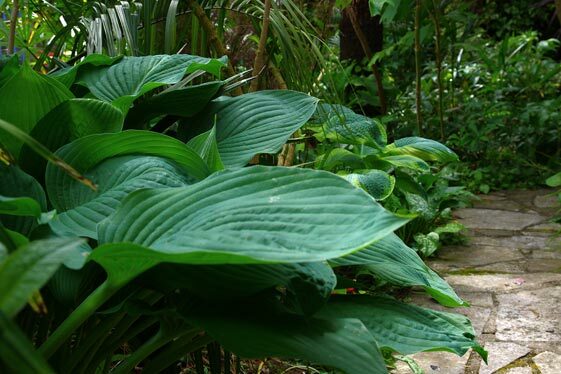 Hostas are important members of the exotic garden. They are not easy plants to grow successfully: slugs and snails cannot resist them, they require a soft, friable soil with adequate nutriments, they sometimes disappear without any word of explanation. The glaucous hosta in the foreground has leaves which grow to a height of one metre or more; it is a good visual companion to Dicksonia and other large exotics. Ponds and streams inevitably attract wildlife. In this case, apart from the goldfish and bleak which we have introduced, the most evident are breeding colonies of the Common Toad (Bufo bufo) and the Palmate Newt (Triturus helveticus). We have observed that the latter, like its close relative the alpine newt (T. alpestris), is far more aquatic than the Common Newt and adults are often seen in the pond at all times of the year. The Palmate Newt is the commonest newt in the South-West; it is also the smallest of the three indigenous species and the liveliest to observe. Other creatures include dragonflies, damselflies, the Common Frog, Pond Skaters and Water Boatmen. Where there is wildlife there are predators and this is most certainly the case here at Southern Comfort. The main culprits are domestic cats (whose charm extends to fouling the garden) and herons. It is only after an almost total depletion of living matter (except pondweed) that we realised what was happening. In order to deter the cats we placed a barrier of sharp spikes around the perimeter of the pond and to deal with the herons we ensure that most of the surface of the water is covered with floating plants such as Duckweed (Lemna) and Water Fern (Azolla). These measures have been successful so far. Although we have had bleak in the pond for only a few years we would strongly recommend them. While their colours are rather drab they more than make up for it by their liveliness, by staying close to the surface and not hiding in crannies, by being prolific breeders and by not stirring up sediment. These small fish follow visitors around the pond hoping for the morsel or two. I suspect that in order to keep them successfully where there is no running water a pump and a fountain (or waterfall) may be required in order to satisfy their oxygen requirements. Whilst toads and newts often coexist together, frogs seem to live a more exclusive life. This is probably because toad tadpoles are unpalatable to newts and that frogs have a taste for young newts. 5. The lawn area contains several memorable plants: a 25-year-old old Phoenix canariensis which has the beginnings of a trunk. Growing in the fibres at the bases of the leaves there are succulents and Billbergia nutans. Close by there is a small clump of Phyllostachys nigra, the Black Bamboo which was planted in 2003. The patch of soil where it is growing is sandy and dry with the result that, despite regular watering and feeding, the growth of the clump over the initial years years was somewhat sluggish. Other plants of note growing around the lawn are: several Trachycarpus fortunei, Crinum x Powellii (pink), Melianthus major, Catalpa bignonioides 'Aurea', Desfontainia spinosa - the shrub which thinks it's a holly, the fragrant Michelia figo, Pseudopanax lessonii 'Purpureus', Pseudopanax carassifolius - a bizarre-looking member of the Araliaceae whose long narrow juvenile leaves hang down and out from its straight stem, Euphorbia mellifera from Madeira, the giant grass Miscanthus floridulus (generally shy to flower but manages to do so here at Southern Comfort - it flowered even during the autumn of 2008); Eucalyptus pauciflora niphophila, Chamaecyparis lawsoniana 'Pembury Blue' (20 years old but very slow-growing). A small Jubaea chilensis (Chilean Wine Palm) was added on the west side in the spring of 2011. One particularly notable palm in this area is Parajubaea torallyi which is native to Bolivia and Ecuador. There is some confusion as to Parajubaea species - reputedly three in total but not particularly distinct. Growing naturally on the equator this is a fully tropical palm but tropical with a twist. It grows in the Andes at heights ranging from 1500 to 3000 metres which, in good old Britannic units, translate into elevations of one to two miles. This quite high and it is cold up there and, although not quite high Alpine, it is most certainly Mediterranean. Another unusual palm growing in the vicinity is Rhopalostylis sapida, the Shaving Brush Palm. This palm is marginally hardy in this area and I have planted it very close to the house to give it the best possible chance in life. It is native to New Zealand and when mature it has a crownshaft - a swelling on the trunk immediately below the leaf petioles which houses their base. It is known to be very slow-growing, dislikes full sun and requires a moist rich soil. This is one for the next owner of Southern Comfort. Mid-spring on the upper terraces behind the house. being south-facing the terraces receive maximum light and heat and therefore are idea for warm temperate and sub-tropical plants. The atmosphere here is decidedly more Mediterranean. The colour and the texture of Clematis 'Niobe' are difficult to resist. This plant is reliable, it accompanies exotics very well, it is not over-vigorous which for my purposes is an advantage and, not least, it will not bring any structure to which it is attached crashing down. 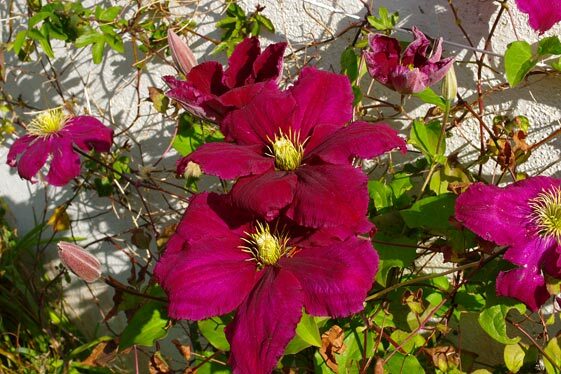 Like all Clematis it must be given plenty of light and heat, adequate moisture and be correctly pruned if it is to give its best. 6. The rock garden - between the pond and the drive. 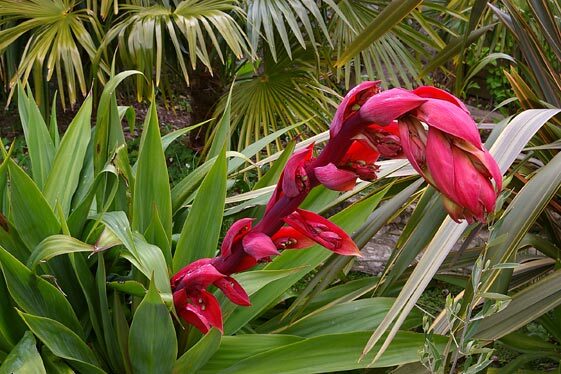 Plants: Hedychium densiflorum 'Stephen', Crassula sarcocaulis, two varieties of Phormium including P. cookianum 'Tricolor', Agapanthus, Bletilla striata, Tulbaghia violacea, Trachycarpus wagnerianus, Helianthum 'Ben Ledi' and the orchid Bletilla striata. 7. The balcony faces due south and has mostly succulents: Aloe, Agave, Echeveria, Aeonium and assorted mesembryanthemums. All plants are in pots. The overhang from the balcony above enables plants to be kept fully dry during the winter rest. In this way the generally tricky Aloe vera (=barbadensis), for example, remains 'outside' for twelve months of the year without any noticeable ill-effects (unless temperatures drop to below minus 2-3°C). 8. The cliff and the Mediterranean area belong to the rear (back) garden. This is hardly a cliff but part naturalistic-looking sloping retaining wall and part exposed natural rock face, about 2.3 metres high and abut 5.5 metres long. While it is in fact south-facing it, nevertheless, acts as though it were a north-facing slope because it is totally shaded by the house a metre and a half away. The wall and the exposed face are both limestone - a low grade marble rock common in the immediate area. Although quick-draining the permanent lack of sun allows a degree of moisture retention except during prolonged hot dry spells in summer. The base is a narrow strip of soil held in position by a low retaing wall; the soil here is often waterlogged - a problem which may yet have to be addressed. One particular irritant of this area is that the redoubtable Helxine soleirolii is endemic here and the cliff has become its epicentre from which it seems to find its way into every corner of the garden. The original idea was to create a 'low maintenance' naturalistic alpine rock face with common unnamed ferns, Campanula and a shade-tolerant Sedum. This worked well up to a point but was not particularly exciting. Something more was needed. The ferns were spruced up a bit with Athyrium nipponicum 'Metallicum' (Japanese Painted Fern), Cyrtomium fortunei (one of the Holly Ferns), Asplenium scolopendrium (Hart's Tongue), Polypodium vulgare 'Cornubiense' (variable-fronded variety of Common Polypody) and Asplenium trichomanes (the Common or Maidenhair Spleenwort). The two Asplenium species have been seeding (perhaps 'sporing' is a better word in the case of ferns) around into neighbouring crevices in the wall to good effect. Other fairly mundane plants were added: Primula vulgaris, Ramonda myconi, Milium effusum 'Aureum', Arum italicum 'Marmoratum', Helleborus orientalis, Hedera canariensis 'Gloire de Marengo'', Clematis 'Ville de Lyon' and a few less mundane ones: Bergenia ciliata, Fascicularia bicolor, Billbergia nutans, Begonia sutherlandii, a gasteria and an Agave bracteosa (Green Spider Agave); all these have been unaffected by recent bad winters. One prominent plant here is Haemanthus albiflos which, according to my edition of the RHS Encyclopedia of Garden Plants requires a minimum temperature of 10°C - is this over-pessimistic? As these plants developed, gained strength and grew the Helxine became less of a visual problem and now, in the company of various mosses, seems almost an acceptable background to the main plants; it is controlled by removing the occasional handful whilst passing. The cliff is now one of the most interesting features of the garden and promises to become even better in the future. 9. The Mediterranean Area. In broad terms this is the whole area of the upper (back) garden above the 'Cliff'. Part of this section became accessible to visitors in 2012. The path and steps along the east side of the garden lead through climbers and a tightly planted area of Trachycarpus fortunei to an area of raised beds, terraces, walls and finally, a greenhouse and pergola built against a high retaining wall. This section of the garden slopes steeply at an angle of around 30° in a southerly direction. This angle ensures optimal light and heat capture for plants with high requirements for both. 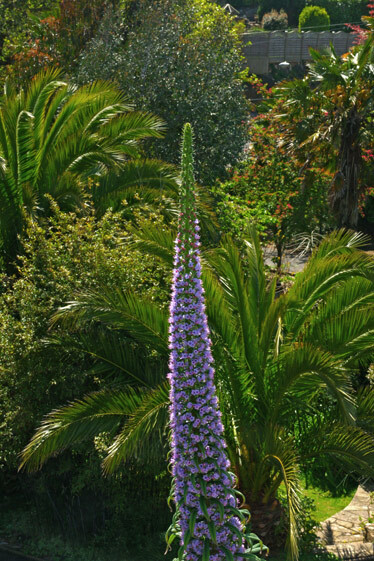 Echium pininana, from the Canary Islands. This plant always attracts attention - it grows rapidly to a height of up to 6 metres, its stem is covered with blue or purply flowers, it attracts flying insects and is monocarpic (dies after flowering). It is also a prolific self-seeder with the result that seedlings are never in short supply. The plant as photographed was 6 metres tall. surrounded by a huge variety of mostly exotic and exotic-looking plants. The greenhouse was built according to conservatory standards (PVC/metal structure & double glazed) and acts as growing area for tender plants, as a plant propagation area, as a winter storage point for the less hardy plants as well as a general garden and potting 'workshop'. It is fully wired and has its own water supply from an underground stream; water is automatically pumped and stored in a 'header tank' behind the retaining wall. The Mediterranean area is now mostly established with more 'open' feel than in the lower garden. The selection of plants here is very large. The following tender and semi-tender herbaceous perennials have been growing and thriving for some years: C. x powellii, Crinum moorei - this crinum has extraordinarily impressive leaves if well-grown and kept away from slugs and snails, Amaryllis belladonna, Arum creticum - a delightful beautifully scented arum lily from Greece, Beschorneria septentrionalis, B. Yuccoides, Astelia nervosa, the less common hardy banana Musa sikkimensis, the banana relative Musella lasiocarpa, Colocasia esculenta (Coco-Yam or Taro - the precise variety has not yet been fully identified), Nerine sarniensis - similar to N. bowdenii but with striking red flowers, Euphorbia rigida - similar to E. myrsinites (which is also present) but with more erect stems, a bright red Watsonia and Strelitzia reginae. Why Ornithogallum longibracteatum (syn. caudatum) deserves a few extra words I do not know. This perennial from South Africa must be one of very few garden plants (if not the only one) whose main feature of interest is not its foliage or its flowers but its bulb. This is a large, green and very prominent affair growing mostly above ground and populated on its surface by small offsets. Its common names are Pregnant Onion. and False Sea Onion. Its other claim to fame is its disproportionately tall flower stem which eventually always topples over. This plant is therefore merely 'interesting' rather than an obvious horticultural asset. It is also doubtfully hardy even in this garden but even though I lose them often there always seem to be some survivors. For the classically minded Ornithogallum is interesting in a completely different way. Its generic name is derived from the Greek 'ornithos' and 'gala' which together mean 'bird's milk'. This mysterious mythical substance was regarded in ancient Greece as an ultimate delicacy and even entered other languages as a description for the unattainable. Thus we find in Poland today the term is used precisely in this sense and, to make matters even more curious, confectionery manufactures have produced a very popular chocolate-covered marshmallow-like candy which is sold under the name of Bird's Milk. To my English ear (the other is Polish) this does not sound too appetizing but I may be mistaken. The upshot of all this is that while we know how Ornithogallum got its name the reason why it got it remains elusive. However, we can be sure that this plant has qualities which are not at all evident at first , or even second, sight. A supporting role is played by the following hardy (some may be doubtfully so in other parts of the U.K.): Zantedeschia aethiopica, Rodgersia podophylla, Bergenia ciliata, Bergenia 'Autumn Joy', Agapanthus and the obligatory hosta or two. Iris unguicularis (syn. stylosa) belongs to this group. This a winter-flowering iris from north Africa and is surprisingly hardy in the U.K. but not always looks its best. This is because its flower stems are much shorter than the erect leaves and therefore tend to be poorly visible. The very obvious solution is to cut the leaves down to almost ground level just before flowering time - ideally in mid-December. This does not appear to harm the plant in any way and results in very fine displays of blooms during the drabber days for a period of up to four months . Kniphofia caulescens is another fine plant for a Mediterranean garden. This Red-Hot Poker has elegantly arching silvery glaucous leaves and looks distinctly tropical from afar. It needs to planted in full sun and have its dead leaves removed if it is to retain its looks; if the stems grow too long, they should cut and the plant re-rooted by inserting it into a small hole right up (or down) to leaf level. Palms are very much in evidence on the terraces. They contribute a slight sub-tropical edge to the lower tier planting. I found it difficult to resist trying out a large selection of species and going further than merely visual requirements would dictate. In addition, therefore, to the ubiquitous Trachycarpus fortunei, T. wagnerianus I have included the following: Brahea armata, B. edulis, Sabal minor, the fast-growing Washingtonia filifera, W. robusta, Chamaerops humilis and Butia capitata. Together with these nine species the total number of different palms in the whole garden is sixteen many of which are fully mature and fruiting - all but one (Rhapis excelsa planted in 2017) are fully established. This brings me onto tree and shrub height. There are no large or even medium-sized trees or shrubs in this part of the garden. None would be suitable. However the following selection modestly-sized plants has so far harmonised well: Olea europea (the European Olive), Magnolia 'Leonard Messel', the Citrus varieties (lemon, mandarin and orange) - to say that fruiting has been modest is to exaggerate, Fuschia boliviana, Reinwardtia indica, a couple of Leptospermum, Euphorbia stygiana, the dwarf Callistemon 'Little John', Grevillea juniperina 'sulphurea', Grevillea rosmarinifolia, Leucadendron strobolinum, Protea cynaroides and the shrubby daisy Olearia insignis (syn. Pachystegia insignis) from New Zealand . This last plant has both attractive robust-looking evergreen leaves - initially a pure powdery white; later the white bloom washes off but the white undersides remain; it has large, neat white and yellow daisy flowers. One of my concessions to fruit in the garden was the grapevine Vitis 'Regent'. I was not over-enthusiastic at first but with time I have grown fond of it; it has decent foliage, its fruits are attractive, they ripen well and the taste is good. Overall it is an asset. However, it needs to be carefully pruned in accordance with grapevine requirements. Amongst the other climbers two are of particular note: Campsis 'Madame Galen' with its orange tropical-looking trumpets and, at the top of the range before it gets clobbered during a bad winter, Lonicera Hildebrandiana, the absolutely stunning Giant Burmese Honeysuckle. This honeysuckle has been growing on a pergola by the greenhouse since May 2011 and has since shown no sign of damage during any of the winters. It is extremely vigorous and has to be cut back drastically after each flowering. The base of its trunk is now (May 2017) just over 30 mm (1½") in diameter - this will go some way to protecting the plant in the event of a severe winter. In the last group I include succulents (including cacti), sub-shrubs and bromeliads. These are plants that are very often tried as part of a first step in the creation of an exotic garden. Very often, as in my case many decades ago, without much success. All the plants I include in this groups in the first place require very well-drained soil, a hot sunny position and no competition from local weeds. Feeding, composting and the like come second. Watering comes third. If these conditions are not met the plants will not be in a good state to overwinter in our climate. Sometimes when succulents such as agaves grow to a very large size they can cope with most conditions; similarly there are species with eccentric requirements such as Aloe polyphylla where the clay pots I grow it in have been standing continuously in water for about eight years. In general the main problem in this country is winter wet together with damage caused by winter wind. Growing these plants close to south-facing walls helps, so does an overhang of some sort. Keeping rain off during winter by covering plants with a sheet of glass, plastic or similar is effective but it is not something I have ever done. All the plants in the mediterranean garden are grown 'as is'. All I have provided is a good well-drained area of soil for them and have chosen the position carefully. By and large, through trial and error and through plain experience such an approach has been successful with the result that I grow succulents which fail in many other gardens. Indeed, they also fail in inappropriate positions in this garden. An Agave americana soon to flower at Southern Comfort. The emerging flower spike is already some 4 metres tall and growing very rapidly. Fully grown this one measured just over 8 metres. 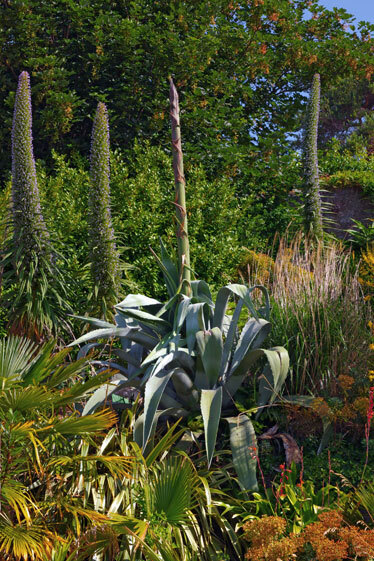 Here the agave is seen growing in the company of Echium pininana. - they die after flowering. However, if the agave is multi-stemmed only the flowering stem dies - in this it is not exceptional amongst the succulents. My plant grew for some 20 years before pushing up an splendid 8 metre plus (27 foot) flowering spike. Other smaller species have also flowered sporadically. Other Agaves I grow outside (some in pots) include: A. celsii (syn. mitis), A. salmiana angustifolia 'Variegata', A. salmiana var. ferox (also known simply as A. ferox), A. filifera, A. montana, A. utahensis, A. ovatifolia and A. bracteosa (this grows on the 'cliff' - see above). I would probably grow more but I find their teeth and terminal spines a nuisance. For those who agree with this I would recommend Furcraea longaeva whose overall appearance, growth pattern and flower all very much resemble a large Agave except that it flowers not after twenty but after six or seven years, is not in the least spiky and on its flowering spike produces a mass of fresh plantlets ready to be potted up the following year. We have had them growing for years in various corners of the garden. All agaves are native to the Americas whereas aloes are native to the African continent and to the Arabian peninsula. Although many Aloe species grow in regions of relative winter wet they find it more difficult than the agaves to overwinter successfully in our climate. There is a strong tendency for them to implode or dissolve over the winter months. However, in the sloping Mediterranean area about eight species have so far succeeded: Aloe striatula - this is the hardiest of the genus and will probably outperform most even agaves in this respect. A. ciliaris - this aloe when small can be easily confused with A. striatula. It is nowhere nearly as hardy as but has been successful here on the south-facing wall of the house and by the greenhouse. A. brevifolia - this small plant grows in fissures in a south-facing stone wall. Occasionally some rosettes are lost during winter. Similarly, A. humilis grows in neighbouring cracks and fissures. It is very difficult to keep slugs and snails of the developing flower buds of the latter. The inflorescence of this aloe is particularly attractive. Another dwarf aloe is A. aristata and it grows at the base of a south-facing stone wall. It seems to be the most hardy of this group of three dwarf aloes and a reliable flowerer. A. striata is a much larger plant of which I have had a few specimens outside for only a few years; they all have yet to flower although in pots and in the greenhouse they flower reliably. Particularly successful is the spotted Aloe maculata which has been very happy over the last six winters and has flowered regularly each year. This and A. striatula are definitely to be recommended as a starter for outside aloes. I have had some difficulty in identifying the final aloe growing in this area - I suspect that it is Aloe longibracteata. It was knocking around outside in a pot for several years where it flowered regularly. It was planted outside in 2016 and it remains to be seen whether it will succeed and flower. The aloe relative, Bulbine fructescens is a low vigorous spreading plant which by reason of its bulk manages to survive anything our winters can throw at it. The most prominent remaining succulents are members of the genus Aeonium which belongs to the Crassulaceae family. Aeonium occur naturally in and around the African continent. I have now lost count of the species and varieties which grow on the terraces. However, there are a few stalwarts which I would not be without: Aeonium arboreum - an easily grown (and lost) plant; A. 'Zwartkop' - similar but a dark bronzy-black; A. undulatum (at, I think that this is the species) with its bulky form and huge rosettes; A. cuneatum - a large spreading ground-hugging species; A. haworthii which I grow in crevices in a stone wall; A. tabuliforme - the Dinner Plate Aeonium which I similarly grow in the same stone wall. A hybrid, A. 'Zwartkop' x simsii, called 'Firecracker' is particularly good in terms of colouring and resistance to winter misfortunes - recommended. All eventually flower at some stage and all are easily propagated from cuttings. Other succulent which I am also now beginning to lose track of is Echeveria. This genus, also a member of the Crassulaceae, is a bit like a ground-hugging Aeonium except that the leaves are generally covered in a white bloom and the plant - its leaves in particular - is generally more fragile. Echeveria are all prone to winter rot if conditions are less than good. If I were to choose one variety I would go for Echeveria 'Peacock' which has large rosettes and seems to be more resistant than most to harsher winters. Here it grows both on the level and in a stone wall. Graptopetalum paraguayense can easily be mistaken for Echeveria. While this plant does not stand out in terms of appearance it does have the merit of being vigorous, easy to grow, easy to propagate from leaves or stems, and also overwinters well. To look good it needs to be planted in large groups. Of the cacti I have three species growing on the terraces: Echinopsis terscheckii, Echinopsis oxygona and a variety of Opuntia engelmanii probably 'Cantabrigiensis'. The opuntia appears to be fully hardy - indeed, it (or a similar plant) has been growing outside in the cambridge University Botanic garden for over 100 years. I do not expect it to fail here in Torquay. It flowers well, produces tasty if seed-ridden fruits and has vicious spines and glochids. Echinopsis terscheckii is a large columnar cactus growing up to 9 metres in height. It grows as far south as northern Argentina and is probably a 'good bet' here in the West Country. However, I was unable to find a growing plant to buy or beg so finally I grew some from seed. But even after a few years they are still all quite small. So as with the Jubaea chilensis, the 9 metre saguaro (Carnegiea gigantea) lookalike may be one for the next owner of Southern Comfort. Echinopsis oxygona, on the other hand, is a medium-sized cactus, it is relatively fast-growing, readily produces offsets and (at least my clone) is very floriferous. From a gardening perspective worrying about the difference between a perennial and a sub-shrub makes little sense. I am perfectly happy to consider sub-shrubs simply as smallish perennials with woody stems or, at least, stems with woody inclinations. A good example is the herb thyme - by looking down on it over the years we see a perennial but if we enlarge it to our own height we are in no doubt that it is a shrub. The same cannot be said of a gladiolus or a daisy. On the terraces brilliant colour is provided from early spring to mid-summer by sub-shrubs of the Compositae: Lampranthus, Carpobrotus and Osteospermum. All three look best when massed and growing on walls on slopes . There is a large choice of colours to be had. All three genera are very easily propagated from cuttings taken during the growing period; some even have the beginnings of roots on the stems just to make life easier for the reluctant gardener. Erigeron karvinskianus gives the impression of being a dwarf version of Osteospermum although its flowers are not as bright. It has the unappealing common name of Fleabane but its other features are rather more positive: it is hardier than its three relatives mentioned above, it spreads easily through the smallest of crevices in stones, it can be easily controlled and contributes to a warm, sunny atmosphere even when it is neither warm nor sunny. It is not often mentioned in gardening books although it has an extensive entry in (my version of) the RHS plant encyclopedia. It is not a plant that is generally 'bought on sight' at garden centres and nurseries - probably because its appeal lies in seeing en masse on a wall or a steep slope. Apart from some epiphytic Billbergia nutans growing on a Trachycarpus fortunei there only two species of bromeliad growing in the ground on the terraces: Fascicularia bicolor caniculata which I have mentioned elsewhere and Puya berteroana (berteroniana). The latter is a magnificent plant especially (some might say only) when it flowers. Ours has not yet flowered nor has the neighbouring and virtually identical but smaller P. alpestris. All puyas are a gardener's nightmare with viciously sharp inward pointing teeth which are decidedly reluctant to release anything even lightly trapped between them. Agaves are feather beds in comparison. The plants in our garden are no exception and their massive size contributes greatly to the threat they pose. 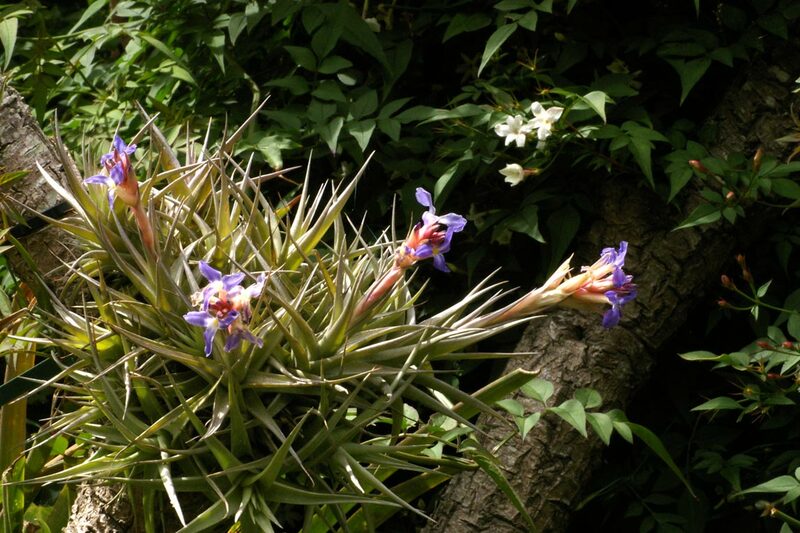 Anyone wishing to grow Puya must be able to provide a cordon sanitaire around them. Having said this I am happy to repeat that they are splendid plants: the foliage draws the eye and the flowers refuse to release it. This is a list of nurseries and garden centres which I and my gardening acquaintances have found useful. They range from multi-acre monsters to a small back garden but there is one thing they have in common: good service and an excellent quality and variety of plants. Each nursery has its strengths and weaknesses and the smaller ones are often very specialist. Most can be found in the RHS Plant Finder. On many occasions we have even found good plants (but often in a bad state) at places like Focus DIY, Homebase and B&Q. High Garden Nurseries, Chiverstone Lane, Kenton, Exeter, Devon, EX6 8NJ; Tel: 01626 899106, info@highgarden.co.uk; open 0900-1700 Tue-Fri; contact: Chris Britton. Dr Maciej Pomian-Srzednicki's original background is in biochemistry but his Ph.D., however, was concerned with politics and sociology. He has been gardening on and off for about thirty years. In 1997 he moved from West Sussex to the West Country and began gardening tentatively with hardy exotics and semi-tender plants in his south-facing sloping garden in Torquay. His garden has since been featured in the local press on many occasions and was described in the "Readers' Gardens" section of Amateur Gardening in September 2009 and also in the magazine Devon Life in October 2011. An article in Coast Magazine appeared later this in 2012. During the Spring of 2017 his garden was visited by Alan Titchmarch in preparation for a programme in the series "Love your Garden" to be broadcast later in the year. Maciej is active in gardening circles. He gives talks to gardening clubs (topics include 'Exotics in the Garden', 'Foliage Plants', 'Gardening in the West Country'), plays host to visitors wishing to visit his garden, has opened his garden under the National Garden Scheme on numerous occasions and is a member of the Torquay Rotary Club Gardeners' Question Time panel. All photographs, unless otherwise mentioned, are copyright © Maciej Pomian-Srzednicki, all text copyright © Maciej Pomian-Srzednicki.